Get into the game! Be a mentor! With these inspirational words, Kevin O'Donnel, or O'Donnell and Associates, ended his Mentor of the Year acceptance comments at the July 30, 5th Annual My Hero Awards banquet, held at the Standard Club of Chicago. The event, hosted by the SunTimes, Judge Marovitz Lawyers Lend-A-Hand to Youth Program, was attended by more than 200 lawyers, judges, friends and representatives of volunteer-based tutor/mentor programs in Chicago. I attended in my role as a member of the Executive Board of the Lend A Hand Program, and in my role as President of Cabrini Connections and the Tutor/Mentor Connection. I've attended this event in previous years and wrote about it here and here. This year was another love fest for mentoring. Each award winner gave a personal testimony, and personal message of encouragement, hoping that others would become involved. Here are some of the quotes that inspired me. Mentor of the Year, Kevin O'Donnel, is a mentor with The Bridge, located in the far North suburb of Palatine. He said, "Get into the game. You get more out of mentoring than what you put into it. It's fun." Law Firm Program of the Year. Colleen Karabetsos, Butler Rubin Salterelli & Boyd's Director of Human Resources told of how she first was encouraged to start a company-based program when she attended the MY HERO event four years ago. Now, after four years working with the Centro Comunitario Jaun Diego Center, a grassroots organization on the South Side of Chicago, she says, "These are my babies." Colleen ended her comments by saying "Every one of us has power to change lives. I'm here to inspire you. Please take time to help others." Making a Difference Award. Thomas A. Staunton, a partner at Miller Shakman & Beem, LLP, was one recipient of this award. Tom joined the Cabrini Green Tutoring Program as a mentor in 1996 and grew into other roles over the past 10 years. He's now Chairman of the CGTP board of directors. Tom said of his experience, "It's been tremendous for me personally. It's given me a chance to participate in strategic discussions and growth of a program." As he described his six year relationship with a student who now is part of the Cabrini Connections program (7th grade to 12th grade), he said "He has had a very positive impact on me." Tom ended his comments by saying "Hopefully this lunch will convince some additional people to do the same." Making a Difference Award. Lupe Garcia,General Counsel, Chicago Park District, became a volunteer at the Midtown Education Foundation in 1995 and has grown her involvement every year since then. She has served in many roles and now is part of the Board of Directors. Lupe said, "I am an inner-city girl. Mentors helped me. " She concluded, "I get more out of this experience than the girls. Volunteer your time. Don't look back (at the end of your life) and say WOW, what did I do with my life." My Hero Award. George Mann, a former attorney with the law firm of McDermott, Will & Emory, has been a volunteer with the Jewish Child and Family Services mentoring program for the past seven years. George was nominated for this award by his mentee, and the boy's mother presented the award to George. This was one of the more tearful parts of the day's ceremony. She told how much George has helped her son, and George said, "I can't believe it's been seven years. This has meant at least as much to me as to Elijah, because in giving, you receive. Spread the word." In my own leadership of a volunteer-based tutor/mentor program since 1975, I've seen dozens of volunteers transformed by their involvement with a youth. Through this transformation I've seen many become more personally involved with the family of the youth they mentored, and more personally involved with the leadership of the organization they served, just like Thomas and Lupe. Thus, the strategy of the Tutor/Mentor Connection is to encourage business volunteers to become volunteers at tutor/mentor programs all over the Chicago region, and in other cities, and to help these programs support that volunteer involvement so that more volunteers will take this leadership path. While each individual program has their own vision of tutoring/mentoring and their own structure, we created the Tutor/Mentor Library and the Conferences, as a resource volunteers and leaders could turn to when they could not find answers to day-to-day problems from their own programs. As more and more volunteers use the T/MC web site for their own immediate needs, we hope they begin to benchmark their programs with other models that they can look at by browsing the program links. As they see ideas working in other programs, our hope is that they will become leaders and resource builders to help make these ideas available to the youth in their own programs. Thus, this hub of information can provide inspiration for constant improvement in every tutor/mentor program in the city, with volunteers taking a lead role to find the resources a program needs to add new ideas and innovate new ways to encourage youth and adults to participate. Ultimately, we hope that enough volunteers from different programs use the T/MC web site for meeting and sharing ideas and that we can begin to encourage groups of volunteers with common backgrounds, such as working in the same industry, or attending the same college, to form and share ideas about "what works" and "what could work better" with each other. If encouraged, such groups can begin to take on role like the Lend A Hand, mobilizing resources from their industry to support tutor/mentor programs throughout the Chicago region, or in other cities. When this happens tutor/mentor programs will have more diverse streams of support, and a more diverse base of volunteers who can model jobs in any industry, and open doors to career opportunities for more kids. Such support can cover a higher percent of the operating and innovation expenses of every program in the region, than can the grants from a single donor like the Lend A Hand Program. When we reach this level of support the distribution of excellent programs will improve, and the impact on youth moving through school and into careers will improve. As Kevin said, "Get into the Game!" Help us make this vision a reality. How Many Volunteer-Based Tutor/Mentor Programs are in Chicago? How do we tell the difference? Since 1993 the Tutor/Mentor Connection (T/MC) has been working with scarce resources to build a more comprehensive understanding of the availability and distribution of volunteer based tutor/mentor programs in Chicago. This is part of our mission to help constantly improving programs be available to youth in high poverty neighborhoods of the region. In the Program Locator of the T/MC web site you can now click on maps like the one shown here, to find brief descriptions for more than 480 entries in our database. You can also find a Map Gallery, with larger versions of these and other T/MC maps. If you look at this map it seems like there is a good distribution of these programs. However, we invite you to look at this in greater detail. We divide the database four ways. Age group served, zip code and time of day service is provided help you understand what age groups are service in specific zip codes. If we want to reduce high school drop out rates, for instance, it would make sense to have programs serving 7th to 12th grade teens available in areas where drop out rates are high. The other way we slice the data is by the type of tutoring and/or mentoring that is offered. In this map we show programs offering pure mentoring. In many cases, such as Big Brothers/Big Sisters, the mentoring is community based, meaning the volunteer meets with the youth at various community locations. These cannot be maps the way a Cabrini Connections can, where volunteers and students meet at a location near where the youth live. Thus, the map does not show many locations where pure mentoring occurs. In this map we show pure tutoring. This could be homework help, or it could be sophisticated tutoring like offered at Family Matters or Highsight. In many cases these locations might just be homework help centers at a Park District or a Library. This third map shows organizations that are site based, and offer more comprehensive forms of tutoring and/or mentoring. The program itself is a source of continuity in the life of the child, and youth are exposed to arts, technology, college and career coaching, in addition to having a volunteer tutor/mentor involved in their life. One of the challenges of maintaining a database is keeping it current. Another is helping people understand the differences between programs so volunteers, parents, and donors might "shop and compare". We have over 480 listings in the Program Locator, but only show a total of 240 on these three maps. That's because in the other 240 listings we don't have information on the age group served, time of day, and/or type of program. While we have one person on the T/MC staff reaching out to try to gather this data, we urge people who operate various forms of volunteer-based tutoring/mentoring to register to use the Program Locator so you can update your own data, or add new listings. We feel the best way to help the public understand the differences between programs is for the programs to show what they do, why they do it, and what impact they are having, using a web site. Thus with many of the listings in the Program Locator we provide web site links. We also have a section where we provide links to nearly 200 youth serving organizations in Chicago. Many of these web sites do a great job of showing why the organization is important. Others are not as effective. Thus, one role for volunteers from media and technology companies, or colleges, it to reach out and become the web developer and story teller for one or more programs in the city. Non profits don't have the money to hire this type of talent. Volunteers don't need to be tutors/mentors to have a significant impact. We've also created some pdf essays, such as Defining Terms, to help people understand the difference between professional tutors, volunteer tutors, volunteer mentors, tutor/mentor programs, etc. The greater the degree of poverty in an area, the more likely all forms of these services are needed. As you look at this information, think of each type of program, and each age group served, as a layer of information on a map. As you peal back the layers leaders in a community or a city can build a better understanding of what programs already exist, and need to be supported with operating dollars, volunteers, technology, etc. They can also show where there are voids which need to be filled with new programs. The maps already show that there is a poor distribution of tutor/mentor programs in many poverty areas of Chicago. When we provide the next set of maps, showing age group served, or time of day, we'll show an even more staggering lack of programs for older youth, or that operate in a time frame when workplace volunteers might serve once a week as a tutor/mentor. I hope you will circulate this article in your friend, family and business network. The next time the newspaper has a headline of kids being killed, or an editorial demanding that we all "do something", point to this article, and our maps, as well as the other resources on the T/MC web site. Use these as a resource to support your actions and we'll begin to reach more kids with better programs. In the past few months there have been news articles about the church Barack Obama attended, and the role of the Federal and State government in providing funds to faith based organizations. It seems that every time some child was tragically shot in Chicago, some minister is leading a march to "stop the violence". I propose that we do some reflection, with small groups of people in churches all over the Chicago region, building strategies that would use the resources of that faith community (its members, its wealth, its influence, etc.) to support the growth of comprehensive, volunteer-based K-career tutor/mentor programs in high poverty neighborhoods of Chicago and the suburbs. Here's some maps to help with that planning. 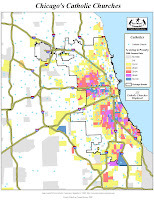 This maps shows locations of Catholic Churches in Chicago, and shows where poverty is concentrated. Imagine if the Cardinal were to set up a task force of CEOs who are decons and members of churches in LaGrange, Arlington Heights, Lake Forest, etc. 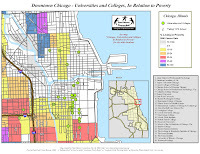 with a goal of creating a marketing plan that would lead to a growth of tutor/mentor programs in neighborhoods of Chicago where there are Catholic Churches, as well as a growth in the number of churches in affluent areas who were supporting these programs with consistent messages from the pastor and Cardinal encouraging members to be volunteers, leaders, donors at programs they can find by clicking the zip code map in the T/MC Program Locator. This map shows Baptist Churches. There are hundreds of them in high poverty areas where these shootings are taking place. Which of these host tutor/mentor programs? Which have received government money as a result of work done by Obama, Hendon, Jones or any other elected official? Imagine if the high profile African American faith leaders were using the information on the T/MC web site to build comprehensive volunteer-based tutor/mentor programs, hosted by a church or bank or community center, in every neighborhood with high poverty, poor schools, too many shootings, and too few tutor/mentor programs. Here's a strategy that faith communities might adopt to engage their members with tutor/mentor programs. This map shows locations of nearly 140 different places where organizations are offering various forms of volunteer-based tutoring and/or mentoring. Our goal is to help everyone of these locations become a best practice at what they do. If churches adopt this same goal, that vision is more likely to become a reality. Use this information to connect your members, and their work/social/alumni networks to these places. Make the same commitment to help kids to careers that we do at Cabrini Connections. Help other programs adopt this same long term vision. You can start this Sunday, but encourage people to look for volunteer opportunities in these programs as they get set to start the 2008-09 school year. One program, called me this week looking for more male mentors. It's the Partnership to Educate and Advance Kids (PEAK). If you can volunteer, contact them now. The Tutor/Mentor Connection would be happy to create a planning map for any faith group, or business group, and put flags on locations which host tutor/mentor programs, or which support tutor/mentor programs. These could be used to determine market share, and build growth strategies. They can also lead to collaboration among churches, hospitals, businesses. A neighborhood may need several tutor/mentor programs, serving different age groups, or different gang territories. However, it does not need one program in every church, or every business. The maps show the various stakeholders who could be working together to build a range of long-term, career focused tutor/mentor programs. When the marches lead to this type of thinking, planning and leadership, we can begin to see a light at the end of this terrible storm. The July 20, 2008 Chicago Tribune had a front page feature asking what type of tutoring was the result of $20,000 grants provided to local groups in Chicago. In another story State Senator Rickey Hendon was called the "king of grants" for helping people in his district get state money. It's a good time to ask, "what do we mean when we say tutor/mentor program"? What do such programs look like? How can volunteers, donors, parents and/or media shop and compare? Here's a graphic that I encourage people to think about when talking about a "tutor/mentor program". On one side people are PUSHING kids to make good decisions that can lead them to jobs and careers. On the other, business is PULLING, using their volunteers, dollars, jobs, technology, to provide mentors, learning experiences, and all sorts of supports to help kids become self-motivated to do what they need to do to say in school and prepare for jobs careers. Here's another graphic, that describes a strategy that connects kids and volunteers. Here's a place on a web site that shows the "success steps" the Cabrini Connections program repeats each year. Here's an essay that is intended to help readers think through this discussion of "tutoring/mentoring". Here's a list of websites that links to more than 200 Chicago area organizations that offer various forms of volunteer-based tutoring and/or mentoring. This web site is interactive. You can rate the programs. Add comments. Or add new programs. The information is intended for parents, teachers, volunteers, donors, media, politicians, business leaders. You can all use this to make decisions on how to build great tutor/mentor programs, or define in your own mind what a great tutor/mentor program looks like. You can use this information to decide where and how to invest time or dollars. If you're a parent, this can help you choose between programs... except that in too many zip codes there are few choices to choose from. In these cases, maybe the programs getting $20,000 from the state should be the starting point from which you all work together to build programs that become the best of the best. 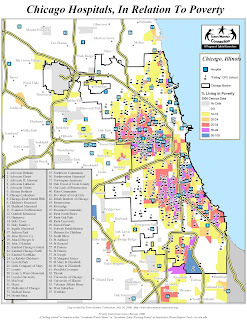 You don't have many choices if these are your kids, or if Chicagoans want kids in these neighborhoods to have better opportunities for jobs and careers. My first advice to anyone is that if a program can't show what it is doing, why it does it, where and when it operates, and how people can get involved, using a FREE blog, or some other FREE web space, I'd be cautious about investing in it unless it could show you some plan to use the money to build an effective program. "If medical researchers were to discover an elixir that could increase life expectancy, reduce the burden of illness, delay the consequences of aging, decrease risky health behavior, and shrink disparities in health, we would celebrate such a remarkable discovery. Robust epidemiological evidence suggests that education is such an elixir. Yet, health professionals rarely identified improving school graduation rates as a major public health objective, nor have they systematically examined their role in achieving this objective." This is a quote from an article by Nicholas Freudenberg and Jessica Ruglis which is posted at http://www.cdc.gov/pcd/issues/2007/oct/07_0063.htm . I wrote about this in a previous blog article here and here. If there is such a benefit, how can we encourage hospitals and teaching universities around the Chicago area to set up leadership and learning circles, with a goal of building youth development, tutoring and/or mentoring programs in the area around each hospital, and throughout the region? This Tutor/Mentor Connection (T/MC) map shows locations of hospitals in the Chicago region. If you search the T/MC zip code map for the area around each hospital, you can learn what, if any, organizations are offering volunteer-based tutoring/mentoring within one or two miles of each hospital. You can also use this interactive map. As schools gets ready to start in August, we encourage each hospital to invite leaders of local tutor/mentor programs, area businesses and faith groups, and the Tutor/Mentor Connection, to meet and discuss ways the hospital and the university can become an intermediary to help bring volunteers and donors to the existing tutor/mentor programs, or help new programs form where they are needed. We created a strategic plan for hospital leadership, and encourage hospitals to use this as a starting point in developing their own tutor/mentor program support strategy, as part of their drop out prevention and workforce development goals, not just as a random act of kindness. We've also created an information library, with links to web sites that show what other hospitals and health centers are doing, and with links to articles that help learners better understand the drop out and education issues that affect the operating budgets of inner city hospitals. This does not need to be a collaboration where everyone marches together. There are dozens of hospitals on this map. Each one can take the lead, in its own part of the city, to develop strategies that help kids make healthier decisions, and which have a positive impact on the hospitals at the same time. During the June 2008 National Conference on Volunterism I heard former President Jimmy Carter say "We have some of the best institutions of higher education in the world. Yet many of them are surrounded by slums." His purpose, and the purpose of The Jimmy and Rosalynn Carter Partnership Foundation (JRCPF), is to encourage the growth of campus-community partnerships and student-led community service learning. You can read more about the role of engaged universities in these T/MC links. I've been adding new maps to our library over the past few weeks. This one shows universities in Chicago. It's aim is to help students, faculty and alumni from each university create tutor/mentor support groups that adopt the mission and strategy of the Tutor/Mentor Connection in their own efforts to help volunteer-based tutor/mentor programs grow in the areas around the college or university. Thus, if you're at Northwestern, or Loyola, you could have a great impact on the growth of programs in the North part of Chicago and in Evanston. 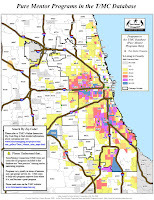 While if you're at the University of Chicago, you could have an impact in helping tutor/mentor programs grow throughout the South Side where our maps show so much poverty and too few tutor/mentor programs. If you're at Dominican University in Oak Park, you could be supporting programs in Austin and on the West side of Chicago. If you're at the University of Illinois at Chicago, you could also be supporting the entire West side. And, if you're a downtown campus, with students and alumni living in all parts of the region, you could use these maps, to develop engagement strategies throughout the region, using the expressways as routes to connect with programs in different neighborhoods. As you look at these maps, use the Zip Code Map and Chicago Programs Links, to find contact information for organizations that provide various forms of volunteer-based tutoring and/or mentoring. You can narrow your search by type of program and age group served by using the Program Locator database. You'll find that some programs are very well organized. Some are small, and may not be so well organized. Some places just offer homework help. Some offer a rich learning environment and connect youth to a wide network of adults and opportunities. However, the goal is not to pick and choose between different levels of program quality. It's to help develop great volunteer-based tutoring/mentoring and extended learning programs in every zip code with high poverty. That may mean helping a small program grow. It also means helping the best programs continue to sustain their work. It means we need to build a distribution of manpower, talent, operating dollars and technology into every poverty neighborhood, not just a few with high profile leaders. Our aim is to share information so that teams in universities begin to develop their own ideal of what mix of services and what type of program structure is best, and that they begin to take on a responsibility for helping such programs grow in the area around the university, with a goal that elementary school kids they work with today can be college freshmen in 6 to 12 years, and college alumni who support the university, and its neighborhood tutor/mentor programs, 15 to 20 years from now. The result of such leadership can be that instead of wealthy alumni donating $20 million for research at an area university, these same alumni might begin to divide that money into annual grants of $40,000 to $80,000 that would provide operating support to volunteer-based tutor/mentor programs in the area around the university, using the web site of the organization, and the recommendations of the university, to determine which groups to support. It also means that thousands other donors will contribute their own time, talent and dollars to support the on-going efforts of programs in different parts of the city and suburbs. This is not something you can wait for the other college or university to take ownership of. It's a form of leadership and engagement that a student, alumni, professor or administrator can launch from their own blog or web site. We've even created a template of a strategic plan that you might use to start your thinking. We've created a Business School Connection to show how students from the business schools of our major universities could use the skills they are learning to mobilize volunteers and donors for area tutor/mentor programs. As you read the paper this week about another shooting in Chicago, or about some leader promising new hope for America, I hope you'll look in the mirror and say, "Solutions to America's problems start with me." 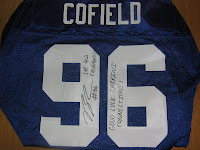 El Da'Sheon Nix, a former football player at Northwestern, and current Administrative Coordinator for Cabrini Connections, just posted this photo and a message on the Cabrini Connection Blog. It's purpose is to show how successful athletes can become fans, and supporters, of programs like Cabrini Connections. We're selling this jersey at the Silent Auction during our July 17th Jimmy Biggs Memorial Cabrini Connections Golf Benefit. One of the co-chairs is Kurt Kittner, former Quarterback for the University of Illinois and Chicago Bears. Kurt has recently joined the Board of Directors at Cabrini Connections, Tutor/Mentor Connection, with a goal of helping us enlist more athletes to use their celebrity and success to draw volunteers and donors to our program, and to similar programs in every poverty neighborhood of the Chicago region. Here's a pdf presentation that illustrates how athletes, celebrities, CEOs and faith leaders might use the maps and database on the T/MC site to draw daily attention, and more consistent volunteer and donor support, to tutor/mentor programs in every part of the Chicago region, including Cabrini Connections. If you want to be a hero, I hope you'll take this role. I hope you'll support our efforts with a donation for our own Golf Benefit, or with a donation to support one or more other tutor/mentor programs in Chicago. Not one good program in one place. Good programs in all places. The way the non profit world works, many non profits compete with each other for limited resources. The result is that some programs are well funded, many are not. This leads to an uneven distribution of needed services throughout a geographic area, such as the City of Chicago. 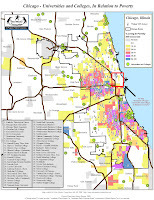 Since 1993 the Tutor/Mentor Connection has been piloting the use of maps to show all of the high poverty areas of Chicago, and to support the growth and constant improvement of volunteer-based tutor/mentor programs in all of these areas. While we host conferences, and training sessions and a vast library of information on our web sites, it's difficult to put this information to work without consistent funding. It's also difficult to build experienced leadership, or human capital, in an organization, without consistent funding, and organizational support for individuals who might make this work a lifetime career. Thus, we post these maps to enlist the involvement of leaders from faith groups, businesses and professional groups, hospitals, alumni, civic and social networks.... everyone who wants to see an end to poverty, or an increase in the number of young people who have the skills and networks needed to succeed in 21st century jobs and careers. One of the best examples of this type of leadership has been growing in the Chicago legal community since 1994. This map shows locations of 31 volunteer-based tutor/mentor programs who received 2007 grants, totaling $240,000 from the Lawyers Lend A Hand Program which was created within the Chicago Bar Foundation in 1993. Note: The Tutor/Mentor Connection was a recipient of a two-year grant to fund it's role, while our Cabrini Connections program was a recipient of a single year grant. This illustrates the self-interest any tutor/mentor program should have in helping such a strategy grow. It helps raise money for your own operations when you create a pool of funds aimed at supporting the growth of tutor/mentor programs throughout the entire city. 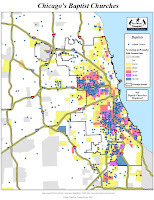 This map shows high poverty areas of the city of Chicago and near suburbs. It also shows locations of poorly performing schools within the city. We created this map as a tool that the Lend A Hand program, and others, can use to plan future giving. Good tutor/mentor programs take consistent year to year operating dollars to attract youth and volunteers and keep them connected for many years. Thus, we hope the Lend A Hand program keeps funding these groups in 2008 and for the next decade. However, as they raise more money from within the legal community, we hope to help them identify programs in areas such as the Southwest part of the city, where no programs are currently funded (partially because of a very limited number of volunteer-based tutoring/mentoring programs in this area). Since Lend A Hand Grants only make up a small percent of the operating budget of any tutor/mentor program, we hope leaders in other industries will use the same map and list of programs to guide their own donation strategies. Our aim is to help programs get 100% of the funding they need, not 5, 10 or 15%. If you're funding tutor/mentor programs in Chicago and would like us to create a map showing the distribution of your funding in the city, just contact the Tutor/Mentor Connection. If you're in another city and would like to develop this capacity, we'd love to talk to you. 8 year old shot. Tells docs: "When I die, I'm going to miss you." Last week was another violent week for Chicago kids. This time the story took a new twist. While in the hospital the boy said to his doctors, "You guys have been so nice to me. When I die, I'm going to miss you." That and the response of Chicago's new police chief, blaming the parents for putting the child in harms way, was what made the headlines in last week's Chicago papers. We mapped this story, and wrote about it on the Mapping For Justice blog. You can see the map at the right. 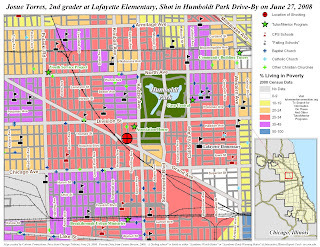 This map is similar to the one we put on this blog on June 20, except the boy in that story died, and the neighborhood was in the South part of Chicago, not in the middle. What's different on today's map are the names of the non profits offering various forms of youth development services, and a variety of icons showing Catholic, Baptist and Christian churches in this. To find descriptions of tutor/mentor programs in this part of the city click on the zip code map for zip codes 60625, 60651, 60612 and 60622. While there are only five non profits in this area, there are dozens of churches who could be places for tutor/mentor programs to operate. We post maps like this so that faith leaders will begin to develop a strategic and long-term approch to the violence and poverty that plague inner-city neighborhoods. Imagine if the Cardinal, or the head of the Baptists congregations in the Chicago region developed an outreach aimed at increasing the number of church locations that hosted tutor/mentor programs, as well as the number of church locations in the city and suburbs, who were supporting these tutor/mentor programs with a regular communications strategy that ties scripture to service, volunterism and philanthropy. If you're a member, or a leader, of a congregation in the Chicago region, I encourage you to share this information with others in your faith community. Form a learning group to study the issues, using the Tutor/Mentor Connection library as resource. From this build a communications strategy that engages members of your faith, and the businesses where they work, as leaders, volunteers and donors at one or more tutor/mentor programs in high poverty neighborhoods of the Chicago region. If you're in another city, duplicate this strategy in support of youth in your own geographic region. Contact the Tutor/Mentor Connection if you want help. Drop outs give reasons for quitting school. "Fewer students would drop out of high school if they took classes they found relevant, had help developing career goals and had strong relationships with adults they see as role models, according to a poll of 500 young adults in Michigan. The solution lies inside schools and communities." This is a quote from an article in the 5/30/08 Detroit Free Press. This is one of several articles on the high school drop out crisis that are included in the July 2008 eNewsletter published by the UCLA Center on Mental Health in Schools. Find the entire newsletter on the UCLA site. If connecting youth with adult mentors and role models is a solution, then the next step is building the marketing and infrastructure to make such programs available to more youth in high drop out neighborhoods. That's the focus of the Tutor/Mentor Connection. School will be starting again in September, but between now and then there are actions that businesses, hospitals, professional groups, colleges and civic/social groups can be taking to help provide more mentoring opportunities. a) Build a communications program, starting in August, that encourages members of your business or community to seek out existing programs where you can volunteer time as a tutor/mentor, talent as an organizer, web builder, accountant or marketer, and/or dollars to cover the operating expenses of these programs. b) If you are in Chicago, and operate a tutor/mentor program, make sure you are included in the Program Links and Program Locator on the Tutor/Mentor Connection web site. Make sure you have staff in place and information on your web site, so that when a volunteer contacts you, he/she is provided with information that will lead them to support your organization. c) If you are not in Chicago, work with local agencies to create a "hub" like the T/MC, listing all of the volunteer-based tutor/mentor programs in your community. This is essential if your community is to have good programs in every neighborhood. d) If you lead a business or civic organization, read the ROLE OF LEADERS and integrate this thinking into your own communications. These are just a few ideas that you can find in the various sections of the Tutor/Mentor Connection web site. If you form a learning strategy, and spend time each week learning from this library, you can begin to be more strategic in what you and your community are doing to help young people get more of the supports needed to prevent them from becoming the next wave of drop outs. What we do in July and August, can have a huge impact on the supports available to k-12 youth from September through next June. Let's not wait for the election or a new president. This is a responsibility each of us can take.